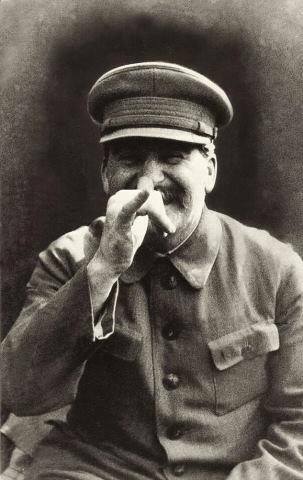 Stalin thumbing off his bodyguard, Lt. Gen. Nikolai Vlasik, who took this photo. Date unknown. The [Russian] protest movement has come under threat of physical violence. With the verdicts and prosecutions imposed on the guys arrested on January 15, 2015 under the new article regarding repeated detentions, we all ended up in a new reality where everyone could be illegally grabbed, a verdict can be fabricated and they can be imprisoned for several years. They can imprison for 3 years for a publication in LiveJournal like they imprisoned Sergei Reznik from Rostov, they can imprison for a solitary picket, when the authorities send in titushkas, like they are planning to sentence 75-year-old Vladimir Ionov. But yesterday it turned out that this is not even the full arsenal of the office. The other day one of our activists got visited at home by one well-known FSB operative who recommended him to leave the territory of Russia in 2 weeks for his own good. This benefactor enlightened us also about our future fate if we do not listen to his recommendations and our fate, by his prediction would be tragic. The left-wing activists would simply all be imprisoned, but for us liberals they have another scenario. A number of us, according to him, will simply DISAPPEAR (i.e. as I understood we are talking about a physical elimination or kidnapping). This unenviable fate, according to him, is prepared by the office for Pavel Shelkov, i.e. for me, Vladimir Ionov, Mark Galperin, Ildar Dadin (the latter two are under arrest) and the mother of many children and ardent supporter of Ukraine, Catherine Maldon. Those liberals from the protest movements who will not disappear will be put behind bars. Of course in this monologue he was not talking about the VIP persons of the opposition who according to rumours have curators in the office, but specifically about those whom the office considered impossible to recruit or buy up. Maybe the goal of giving us this information is to force the most active activists to emigrate from the country, like “they will leave and it will become calmer, the order of the Chief Sterkh is carried out.” [Ed. note: Putin is Chief Sterkh, a reference to him flying with the cranes]. But it is possible that this is a very real threat to our lives. So if the people mentioned by me really do suddenly disappear or die in a traffic accident, or their heart stops in the bath like what happened to Putler’s enemy in Germany (the office has many means of removing the unwanted) know that this is an elimination of us that has been planned in Lubianka [FSB office]. Such people as we do not simply die for no reason. I think many of us will now think about emigrating from Russia. And just in case, detailed information about who the threat originated from and all the circumstances of this chat are in a safe place with our friends outside of Russia and in the case of our elimination will be made public in Western media and posted on the Internet. In the words of the shoemaker’s son Dzugashvili [Stalin] – life has become better, life has become merrier! This entry was posted in Analytics, English, English News, Eyewitness stories, Pictures and tagged #RussiaInvadedUkraine, #StopRussianAggression, freedom of speech, Human Rights, Russia. Bookmark the permalink. 30 years of good West INTELIGENT work with best friend to find top solution. They must work really hard to find this solution for all the money they have used+colected. Is not it responsibility of politicians? ?